Malibu Lagoon Official Opening & Ribbon-Cutting Ceremony: Friday, 3 May, 11 A.M.
Malibu Lagoon has it’s official opening ceremony on Friday, 3 May at 11 AM. It was a long and often acrimonious process, but now little remains to be done except watch the plants grow. 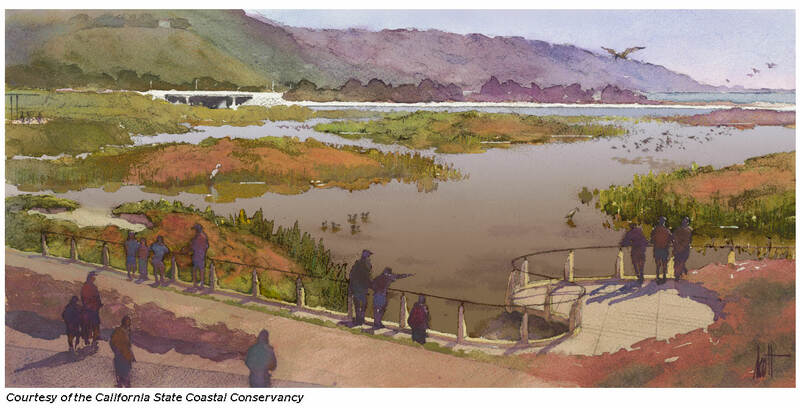 Santa Monica Bay Audubon Society has long supported this project, and we have been especially invited to attend. California State Parks asked if we could have members with telescopes on hand to help attendees see and learn about the birds. We have a couple of volunteers so far, but we need more. How about you? The more birders we have on hand, the better. To volunteer, send an email to: webinfo49 [at] att.net. To simply attend, just come. Directions: Malibu Lagoon is at the intersection of Pacific Coast Highway and Cross Creek Road. Look around for people wearing binoculars. Parking in the official lagoon lot is $12+ or by annual pass. You may also park either along PCH west of Cross Creek Road, on Cross Creek Road, or on Civic Center Way north (inland) of the shopping center. Be careful – some parts of PCH are off-limits (read the signs carefully). Lagoon parking in the shopping center lot is not permitted. ← Placerita Canyon Field Trip Report, April 13. Please check the LA EXTRA section in today’s Times. The current status of the Lagoon Restoration is presented in an article with the sub-title “Restored or ruined?”. After visiting the lagoon twice in the past few weeks, I was concerned regarding the possible negative public reaction if the L.A. TIMES highlighted the present barren appearance of the site. I’ve written a lengthy letter to the article’s author. It’s too long to be published, but at least it apprises her of many details which were not in her article, for possible future reference. Thanks for the heads up.